Long before Eleanor of Aquitaine was born in 1122, scandal surrounded her family. Her grandfather Duke William IX of Aquitaine had been carrying on an affair with Dangereuse, wife of his vassal Aimery I de Rochefoucauld, Viscount of Châtellerault. A Papal legate warned William that he'd suffer the church's wrath if he didn't give up his mistress, but not even the threat of excommunication swayed him. Dangereuse's influence extended beyond her relationship with the Duke; she apparently influenced his decision to permit his heir, also named William, to marry her daughter Aenor. Eleanor was the first child of William X and Aenor's union. In time, she would prove she had inherited more than just the willfulness of her paternal grandfather and the shrewdness of her maternal grandmother. Photo: Eleanor of Aquitaine riding with one of her sons. Eleanor grew up the cultured courts of her father at Poitiers and Bordeaux, where she learned to read and speak Latin and Poitevin, though apparently not to write, as well as the arts of music and literature. She developed a love of falconry and riding. Her father's heir William died when he was four along with their mother, and while her father had other illegitimate sons, he did not acknowledge them as potential heirs. Eleanor's father died in April 1137 while on pilgrimage to the Shrine of Saint John of Compostela, in Spain. At his passing, Eleanor inherited territories that encompassed almost a third of modern France. Entrusted to the care of King Louis VI of France, Eleanor soon found herself facing the prospect of marriage to his son Louis. When the new king Louis VII clashed with Pope Innocent II over the appointment of an archbishop, the Pope blamed Eleanor's influence over her husband, perhaps recalling her grandfather's defiance of the Church. When Eleanor’s younger sister married, scandal again touched the ducal family, for her new husband had cast aside his first wife. Eleanor urged her husband to support the marriage. Trouble started for Eleanor when the influential abbots Bernard of Clairvaux and Suger judged her too worldly, high-spirited and much too involved in the politics of her husband's kingdom. Although her influence over her husband seemed strong, Eleanor also sought to do her duty by Louis and bear his heirs. In April 1145 their daughter Marie was born. Eight months later, at the command of the new Pope, Eugenius, King Louis took up the Second Crusade, and his wife went with him accompanied by her train of ladies. 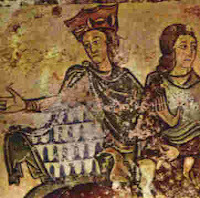 One of Eleanor's vassals, Geoffrey de Rancon protected the rear with the ladies and their baggage. A brutal attack followed and Eleanor was blamed for causing the army to dawdle. While on Crusade she and her husband visited her paternal uncle Raymond of Antioch, son of Duke William IX. Eleanor and Raymond's closeness from her childhood days continued, and seeing this, Louis grew suspicious, and accused his wife of having an incestuous affair with her uncle. Likely, he also grew tried of her arguments on Raymond's behalf for help in the conquest of Aleppo. For this, Louis imprisoned his wife. Perhaps understandably, Eleanor had enough of her husband by the time they returned to France, but the Pope refused her first petition for an annulment and ordered the pair to reconcile. Their second daughter Alix was born in 1151, but the prospect of a male heir dwindled with their growing continued. In March of 1152, the union of Eleanor and Louis was annulled, allowing for both to re-marry. And two months later, Eleanor wed her second husband, Duke Henry of Normandy. The grounds for the dissolution of her marriage to Louis VII should have prohibited Eleanor's second marriage; the new couple were third cousins, just like Eleanor and Louis, and both were descendants of Duke Robert II of Normandy. But her willfulness ensured that Eleanor got what she wanted; she had sent envoys to the Duke and suggested their marriage herself. Henry was twelve years her junior and within two years of their marriage, became King of England. Together they had at least five sons; three of whom would be a source of strife between Eleanor and her husband. When Henry II quarreled with the archbishop Thomas Becket and sanctioned his murder, Eleanor was horrified. She'd withstood Henry's numerous affairs but a simmering resentment of her husband soon turned dangerous. In 1173, in support of an eighteen-month revolt against the King led by their youngest son, also named Henry, Eleanor tried to follow him and his brothers Richard and Geoffrey when they withdrew to Paris. Arrested, Eleanor learned the revolt had ended in July 1174 during her imprisonment at Rouen. Over the next sixteen years, Eleanor spent most of her time separated from her husband and children, though her husband sometimes relented and allowed her release at Christmas. She enjoyed her first years of freedom after her husband’s death and the ascension of her son King Richard I, surviving into the reign of her son King John. Eleanor died in 1204, and though many scandals have been attached to her name, she remains one of Europe's most remarkable medieval women. 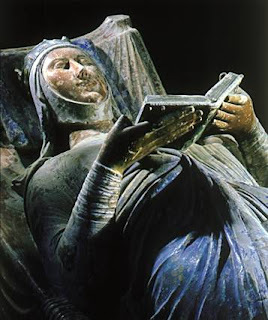 Photo: Eleanor of Aquitaine's effigy. She's buried beside her husband Henry II and her son Richard I.